John O’Brien was once lauded as the greatest American footballer of his generation. He successfully conquered Europe with his exploits at Ajax in Holland’s Eredivisie and drew many plaudits for his performances for the US national team at the 2002 World Cup in Japan and South Korea. But for the Californian born soccer star, his career was left largely unfulfilled. Blighted by a history of chronic injuries, O’Brien never truly reached the level of performance that his potential promised, however, he did enjoy sustained success for a short time and his influence on football in the United States was no less important. O’Brien’s first experience of the famed De Toekomst youth set-up at Ajax came as a bright eyed 14-year-old, through the connections of his coach, John managed to get the opportunity to train with the youth sides. At 16 he was invited back for a trial and at the age of 17 in 1994 he signed for the Ajax amateur side. Having become the first American to join the Ajax youth ranks, the pressure of expectation on his young shoulders was enormous; however, playing outside the USA meant that his early development was to some extent, left out of the domestic spotlight. Having said this, he was still held as one of the most talented footballers to emerge from the United States and O’Brien showed outstanding qualities. Technically gifted, he had poise and composure on the ball, close control and the ability to beat a man off the dribble as well as a dangerous cross from the wide areas. In March 1998 he made the leap to the Ajax professional side signing a three year contract. He was subsequently loaned out to FC Utrecht for the 1998-1999 season, where he made his professional debut in Holland. O’Brien finished his first full season with 19 appearances under his belt and 2 league goals. On his return to Ajax he had trouble breaking into the first team, several household names held down the midfield positions including Andy van der Meyde, Aron Winter and Tomás Galásek and even a young Rafael van der Vaart who was making promising strides in his early career. O’Brien was limited to 24 appearances from 1999 to the end of summer 2001. Injuries also had a detrimental effect, as they would later in his career, especially during in the 2000/2001 season, A heal injury meant John only managed to make 4 appearances during that season and he ended up making his comeback in an unfavoured position at right back. After a stuttered start, O’Brien managed to break into the first team on a consistent basis during the 2001/2002 season which also turned out to be his most fruitful campaign in the Dutch capital, maintaining form and avoiding injuries. Under the leadership of Ronald Koeman, Ajax had a very strong squad blessed with the abilities of a young Zlatan Ibrahimović, van der Vaart and Wesley Sneijder as well as the likes of Mido, Galásek, Christian Chivu and van der Meyde. A truly talented Ajax side went on to win a domestic double, capturing the Eredivisie title by 5 points ahead of PSV Eindhoven in second place and winning the KNVB Cup final against O’Brien’s former club, FC Utrecht. Ibrahimović grabbed the golden-goal winner in extra-time of the cup final, securing a 3-2 victory. Although his favoured position was in the central of midfield, O’Brien was equally comfortable playing either at left back, left midfield or a deeper central midfield. O’Brien’s versatility was key during the Ajax double winning season. Despite not featuring in his strongest position in midfield, O’Brien was ever present down the left flank, either at full back or further forward on the wing, establishing himself as a stalwart of Koeman’s starting eleven. Marauding forward, his touch and dribbling ability allowed O’Brien to operate as a modern day, attacking full back, travelling down the wing to offer another option going forward and delivering crosses from the left flank into the path of Koeman’s favoured strike partnership of Ibrahimović and Mido. O’Brien finished his most successful season as Ajax’s fourth most used player with 34 appearances and 2 goals in all competitions as well as adding 2 winners medals to his cabinet. Fit, on form and with the World Cup in Japan and South Korea just around the corner, O’Brien had chosen the perfect time to realise his potential and fulfil those expectations set back home. He was to become a figurehead of the Unites States National Team in the summer of 2002. The USA entered the 2002 World Cup in Japan and South Korea on the back of their CONCACAF Gold Cup victory back in February of the same year. Head Coach at the time, Bruce Arena picked an experienced squad with senior players like Claudio Reyna, Brian McBride and Brad Friedel but balanced this with young and vibrant players like Landon Donovan and DaMarcus Beasley. Although nursing a toe injury during the week previous to the tournament, it was impossible for Arena to omit O’Brien from the squad after his outstanding season with Ajax. Drawn in Group D alongside European heavyweights Portugal, Poland and co-hosts South Korea there was hope that the US could go through to the knockout stages, although not much hope that Arena’s men could get a result against Portugal’s own ‘golden generation’ in the opening game. 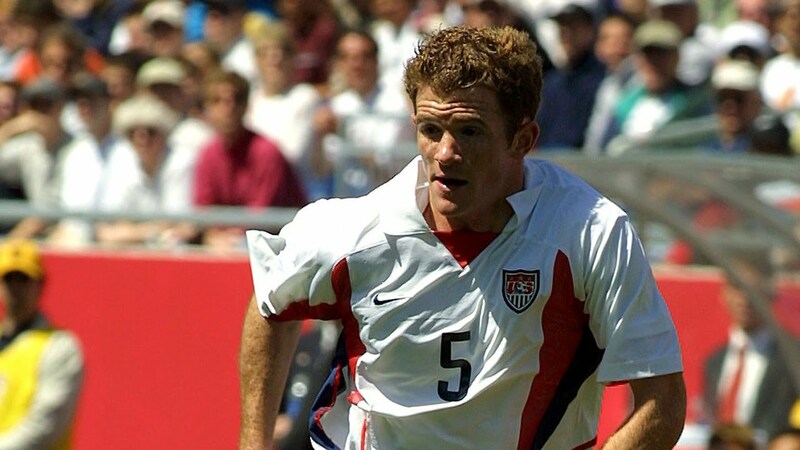 This thought was dispelled almost immediately, four minutes into the USA’s opening game against the Portuguese, US captain Earnie Stewart took a corner; Brian McBride rose to head the ball goal wards. Goalkeeper, Victor Baia could only parry McBride’s header straight into the path of John O’Brien who was unmarked at the back post. O’Brien smashed the ball into the roof of the goal to give the USA a shock 1-0 lead. Despite O’Brien’s fourth minute strike taking place in the early hours of the morning in the states and probably being missed by many fans, the American from Amsterdam had set the USA on the path to a historic victory. The USA went on to take a dramatic 3-0 lead in the first half through a Portuguese own-goal and a trademark Brian McBride header. It was the first time since 1930 that the USA had scored three goals in a World Cup match and despite a Portuguese comeback, Arena’s side held on to a 3-2 lead and registered their first World Cup victory on foreign soil in over 70 years. The US managed to finish as Group D runners-up behind fellow underdogs, South Korea. A 1-1 draw against the co-hosts was followed by a 3-1 loss to Poland, but the Portuguese and the Poles were well below par in a disappointing tournament for both and thus the US qualified for the knockout stages. The USA faced their great rivals Mexico in the premier clash in the first knock-out round of the tournament. The Mexicans were favourites to make it through to the quarter-finals but as is the case in any derby match, the rule book generally goes out of the window. Goals from Brian McBride and Landon Donovan secured a 0-2 victory for the USA but the game wasn’t without controversy. O’Brien could have conceded a penalty with the USA leading 0-1 as he handled the ball inside his own area but escaped punishment. “It was a freak play. Despite the Mexicans grievances, their misery was concluded as Rafael Marguez received his marching orders in the 88th minute and a rampant USA went through to the quarter-finals to face Germany. Maintaining their underdog status, the USA took the game to the Germans and actually enjoyed more of the play throughout the game, creating plenty of chances but failing to land the killer blow. The USA had more possession and more shots on goal, but it was the Germans that managed the crucial breakthrough with Michael Ballack converting a Christian Ziege free kick. A controversial Torsten Frings handball on the German goal line was the only thing that stood in the way of a USA equaliser and a moment that would consign Bruce Arena’s side to defeat. The obvious but unintentional handling of the ball by the German midfielder went unpunished. Frings’ handball could be seen as karma balancing itself after O’Brien’s very own handball against Mexico, either way; the USA went out in the quarter-finals. However, the team’s performance at the 2002 World Cup had captured the attention of fans in the states, who awoke to watch their team’s matches in the dead of night, but it also announced the USA to the football superpowers of Europe. And so, John O’Brien reached the high point of his career, enjoying a trophy-laden season with Ajax and playing all five of the USA’s games at the World Cup, culminating in the quarter-finals. O’Brien’s contribution to the national team was outstanding, from his opening goal against Portugal to his array of passing, creativity and ability to dictate the midfield. “He’s as talented a midfielder as US soccer has ever had – a terrific passer of the ball, read(s) the game well and scored goals as well, even though it wasn’t his forte. He was one of the better players on that  US team, and was as good as most midfielders in that World Cup. Soon after the World Cup, O’Brien began his slow decline. A mix of bad luck with injuries and a slightly abnormal physiology, he struggled to reach and maintain full fitness. O’Brien’s own body had robbed him of the career his early potential had promised. A case of scoliosis (curvature of the spine) meant that his hips were out of balance and thus every time he injured a leg muscle it would prove an extra, uphill battle to regain fitness. Despite numerous attempts at rehabilitation his chronic injury problems meant that he only made another 20 career appearances for Ajax, ADO Den Haag and Chivas USA from 2002 to 2006, and thus concluded a career that never really reached the early expectations. However, from 2001 to 2002, to steal a well coined cliché, John O’Brien became an American hero.